Position-holders of Government College University (GCU) Lahore in the Intermediate Examinations 2018 on Thursday called upon GCU Vice Chancellor Professor Dr Hassan Amir Shah to discuss and guide them for their future education plans. GCU Engineering Department Dean Professor Dr Riaz Ahmed and GCU Intermediate Studies Director Syed Tariq Rizwan were also present. Speaking on the occasion, Tariq Rizwan revealed that GCU had secured seven of total 15 positions for boys in the Intermediate Examination 2018 which was a big achievement. He explained that GCU students clinched two positions in the Pre-Medical Group, three in Pre-Engineering and one each in Humanities and Commerce Groups. Talking to GCU vice chancellor, the topper of Pre-Medical Group (Boys) Hasnain Mushtaq, said that GCU was the only option left for the top students in public sector at intermediate level. He laid stress on the fact that the government should take concrete measures for uplifting the standards of other public sector colleges of Punjab. Sheraz Ahmed, who secured second position in Pre-Engineering Group for Boys, said that late physicist Abdus Salam was his ideal. “Professor Abdus Salam was the first and only Pakistani who received the Nobel Prize in Science and I have a dream to be the second Pakistani in this category,” he added. 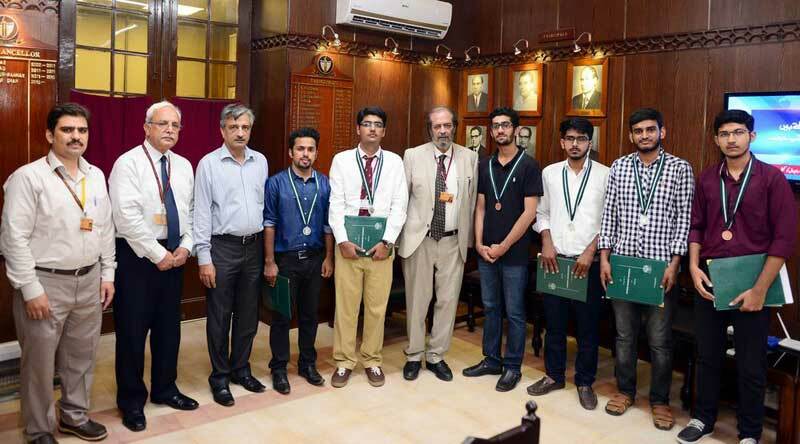 GCU VC Professor Hassan Amir Shah congratulated the position holders and advised them to retain the fundamental norms of creativity, farsightedness and persistence which were always cherished at GCU. “For this my students, you need to resist the onslaught of time which compels you to compromise your values and succumb to various social pressures,” he added. Professor Hassan Amir Shah told the students that they must bridge the gap between their ideals and the cruel realities of life. “Your success lies in the measure of patience and determination that you may muster up,” he concluded.